The American Humane Association estimates that the dog population in the United States lies between 70 and 78 million with an average of 1.6 to 1.7 per household. Contrary to popular belief, dogs suffer the same diseases as humans such as obesity, diabetes and cancer – cancer being the highest cause of death. The most common causes of veterinary visits are associated with dog grooming and hygiene such as ear infections, allergies, skins infections and growths. Hair/fur trimming is an important part of the grooming process and should begin from the early years as a puppy. If you wait too long, the dog may not be so agreeable to your efforts during grooming, especially when it comes to tasks that involve clipping. If you have a dog with plenty of hair, the grooming sessions may be more intense and time consuming. However, even dogs with short hair require the routine hair/fur clipping. Routine clipping ensures the early detection of any abnormalities such as the presence of ticks, fleas or skin conditions like inflammation, rash and patches. It also keeps your dog clean and matte free. ​An article by bestinshowgrooming.com found that matted hair is actually very dangerous for your dog and many professionals will consider your dog a liability and refuse service. This is because they would need to do a very close shave that can result in severe skin irritation or a burn. They also stated that some dogs have had to be referred to a veterinarian for sedation prior to a shave. It is important to note that despite dog hair looking soft, it is actually very thick and as a result, clipper blades become dull over time and require sharpening in order to result in a clean, uniform shave. In the section below, I will outline the steps you should take when sharpening your dog clippers at home. This will be more cost effective than having to buy new ones every now and then when they get blunt. Locate the screws holding the blades to the clipper itself (note: they are usually located near the blade). Carefully separate the blades and anything else that comes apart (clippers differ by manufacturer- some may have a few more items included). Remember to take note of where the pieces were situated. If the blades do not come out easily, DO NOT use your fingers to pry them apart. Find some tweezers and pull them apart. There may be hair and other dirt from previous shaves. Use a metallic brush e.g. steel wool (what you use to clean metal cooking pots) to gently remove the dirt or hair and clean the blades. Soak the blades in a cleaning solution to remove visible rust if any. Lemon juice has been shown to be a lifesaver when it comes to cleaning out rust. Once they are clean, dry the blades by placing them on a clean paper towel. You can repeat the above step until you are satisfied with the cleanliness before drying them. You can either leave the blades to air dry or carefully pat them down with the paper towel. Flat Stone: I recommend this method as it is the most convenient for me and perhaps the cheapest of the three methods. You simply get a nice flat stone and rub each blade, back and forth, to sharpen. You can also take the commercial route and buy an oil stone that is either diamond or steel plated. Grinding wheel: This wheel has either a wet or dry solution in its ridges. You put the blade in the wheel and the solution is applied on the clipper blade as it turns on the wheel. The solution is almost like using sand or ash on an aluminum pot to give it back its lost shine. Lapping wheel: This wheel is made of cast iron with grooves on the surface. The wheel rotates slower than a grinding wheel and the finish on the blades is smoother. You should place the blades inside the ring of the wheel. When turned, the blades move on the wheel. It also has a solution like the grinding wheel which is applied on the blades. Once you are satisfied that the blades are sharp, carefully put the pieces back together in the order you removed them. Screw the blades in place. Note that sometimes, all your clipper blades need is a good clean. You could test them after cleaning to see if they are still sharp enough and do not require sharpening. How often you need to sharpen your blades depends on how often you use them and for how long. I have a Chihuahua and therefore only use my clippers for a few minutes when grooming, therefore I only sharpen my clipper blades every six months. Those with larger dogs or with more fur may need to adjust this frequency. 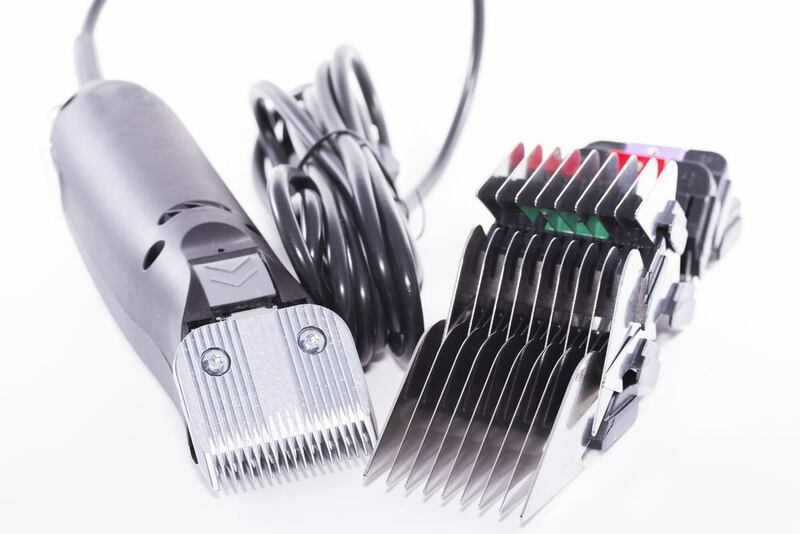 For groomers who use their clippers every day, they may need to sharpen every month. where do I get a stone to sharpen my blades? Thanks for your question. You can easily buy this stone from online or your nearest shop.